Corporate relocation services from the professionals at Bulldog Movers can help make an employee transfer as smooth as possible. 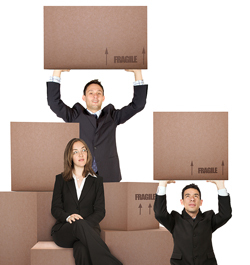 Our expert movers are highly trained and experienced in moving household belongings of all kinds. Whether you need to relocate your employee locally or long distance, our moving teams can deliver their items safely and in a timely manner. We have a fleet of more than 27 of our signature red trucks, over 100 full-time employees, and the distinction of earning the Consumers’ Choice award for nine years in a row, making us one of Atlanta’s largest and most reputable moving companies offering relocation assistance. Contact Bulldog for your corporate relocation and find out why 80% of our business comes from the referrals of satisfied customers across the Atlanta area. Bulldog is fully licensed, insured, and regulated by the by The Georgia Public Service Commission and The Federal Motor Carrier Administration.